What Credentials Should I Look for When Selecting a LASIK Surgeon? A bad eye procedure outcome can negatively affect your life in a serious way. If you’re thinking about getting LASIK to correct your eyes, there are several factors to look for when selecting a LASIK surgeon. Medical doctors are legally permitted to offer surgical procedures outside their own specialties. Make sure the LASIK surgeon you are considering is a licensed ophthalmologist. Eye surgeons should be trained in ophthalmology, so be certain that your potential LASIK surgeon is an ophthalmologist licensed in your state. State licensing boards can validate a surgeon’s credentials. Similarly, not every ophthalmologist is board certified. 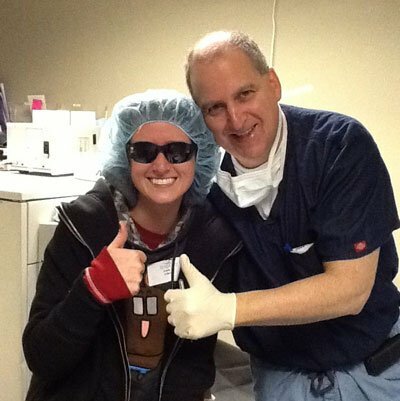 You should confirm that your LASIK surgeon is a board certified ophthalmologist. Dr. Jonathan Woolfson, the founder and medical director at Woolfson Eye Institute, is a board certified ophthalmologist with memberships in the American Academy of Ophthalmology, the American Society of Cataract and Refractive Surgery, the International Society of Refractive Surgery, and the American Medical Association. Experience should also be very high in the list of things you’ll want to know about your LASIK surgeon. How many procedures has he or she performed? 10,000 hours has become the accepted standard to be an expert in most fields. Not a lot of ophthalmologists have spent 10,000 hours performing LASIK. We’re proud to have a doctor who has done 80,000 LASIK cases — translating to well over 10,000 hours of LASIK-related care. Being able to trust the doctor and see this person’s reputation in the community is important. Numbers are important, and 80,000 is a large one, but it’s also meaningful to consider who some of the patients are. Do eye doctors and professional athletes choose the doctor for surgery? What do these patients have to say about his or her experience? More than 300 eye doctors have chosen Dr. Woolfson to perform their own LASIK. Also, many professional athletes, celebrities, business leaders, and people like you have chosen Dr. Woolfson for their LASIK surgery in the Atlanta area and the Southeast. Many providers of LASIK may get good results, but not every surgeon monitors and analyzes their results. A practice with good quality control should have a sophisticated outcomes analysis program. At Woolfson Eye Institute, we are committed to outcome analysis in order to continue to constantly improve what we’re doing. Dr. Woolfson has the credentials, the experience, and the trust of eye doctors. Check out what our patients say about us. When you’re ready, fill out our free, online self-evaluation to find out if you’re a good candidate for LASIK surgery or another vision correction surgery.